It was a rather disastrous Friday morning when I was forced to drag my sweet, little arse out of the house to look for a coffee shop. It was an aggressive attempt to save my day’s worth of bread-and-butter. Two commutes later and a series of unfortunate events – all before 9 am, by the way – I sat at one corner of Caffé Firenzo desperately trying to catch my breathe. It was a very challenging day, I must say, but I straightened myself up and sorted my day’s worth of tasks like a decent human being. In between reading my emails and tweaking websites, I found myself whining for many reasons. Simply put, I was a woman possessed. I was that kind of woman having a bad case of PMS. I was about to lower my guard when I thought of a better idea: food trip! I didn’t need my grumpy hormones to tell me that, did I? The solution to every depressing situation is to eat anything that makes you feel comfortable and happy. In this case, I thought of ice cream. 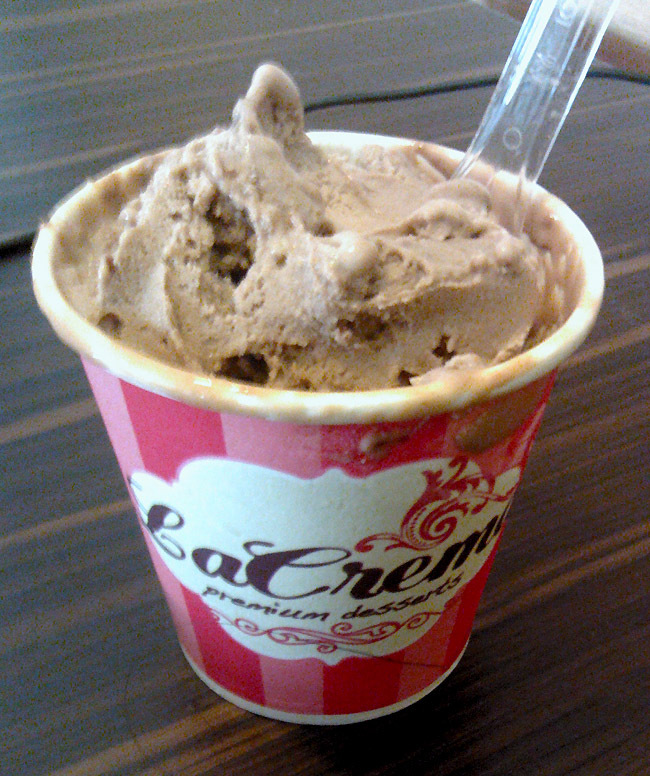 Good thing Caffé Firenzo offers La Crema Premium Ice Cream. I ordered two piene (medium) cup, within an hour interval. I’ve been through hell that day. So yes, feel free to judge me. The photos do not do justice because I only used my tablet’s camera. I had enough baggage with me when I left the house to even bother toting a decent gear. I’ll just post a better photo when I get the chance. Anyway, the thing I like most about artisan ice cream is that, you get so much interesting stuff in one cup. Plus, the flavors are unique and taste very genuine. 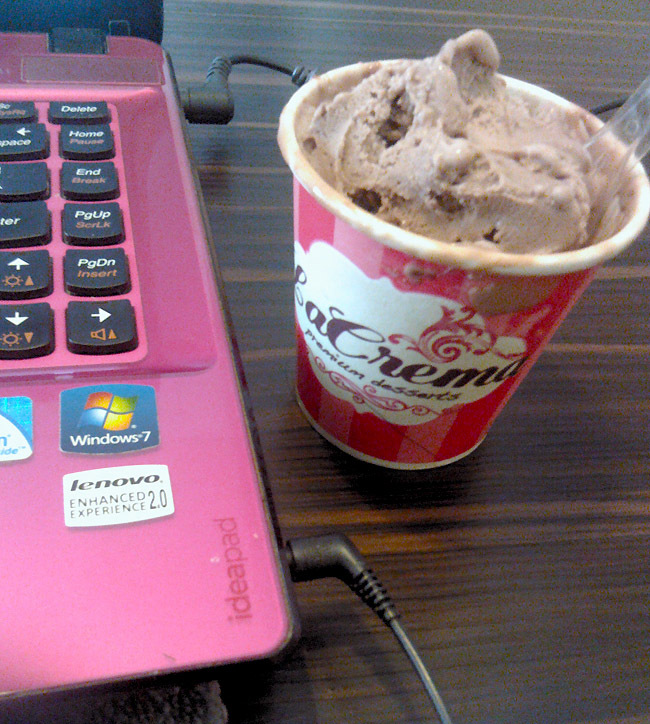 Take this Fererro Rocher ice cream for instance. The texture is very smooth and creamy with bits of real Fererro Rocher in it. Every spoonful is a joy because I get a modest serving of chocolate, wafer, and nuts. By saying modest, I mean the solid bits aren’t that big but are enough to burst into an explosion of chocolate goodness in your mouth. To say it easy, it’s like eating real Fererro Rocher with whip cream. Can you imagine? An hour later, I still wasn’t feeling okay. Fine, I lied. The first cup already made my day. But hey? I’m in there anyway. I had to go for it. Besides? How can you say no to something as good as frozen dessert? Anyway, back to my second cup. I chose Strawberry Cheesecake because it looked so delicious. And it tasted even more delicious when I shoved a spoonful of it in my mouth. It was divine. Like the first one, the texture is smooth and creamy with bits of real cheesecake in it. I felt like I was eating an ice cream cake more than anything. Imagine an almost frozen Strawberry Cheesecake, but creamier. 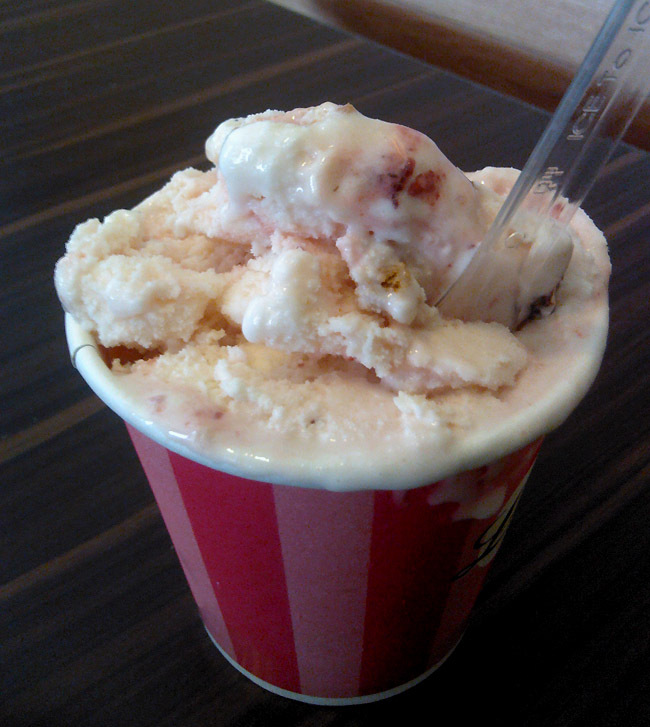 I also liked that it’s not too sweet and there were generous amount of strawberry bits. It’s every ice cream fanatic’s dream come true. Looking at these now makes me want to grab them from my laptop screen and devour them in full submission. These saccharine indulgence truly made my day less painful. Unfortunately, they were only good while they lasted. As nightfall came, it rained hard. I was stuck downtown. It was indeed a terrible Friday.